Unsurprisingly, he was not elected. 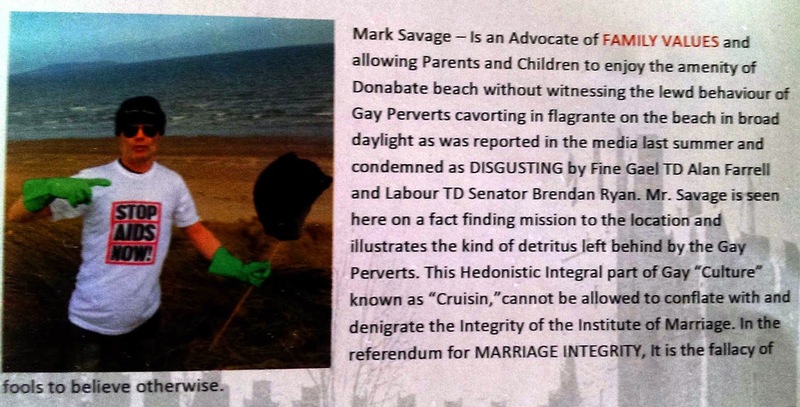 He now apparently objects to a Reddit thread characterising him as "Mark Savage - North County Dublin's homophobic candidate". Following an unsuccessful request to Google to have that thread deindexed, he complained to the Data Protection Commissioner who refused to order that Google do so. He has now appealed against that decision to the Circuit Court. I look forward to a full hearing, though I doubt it will be over in his optimistic estimate of two hours and I doubt he will be successful in his claim that Google should censor discussion of his views as publicly stated in an election campaign. If anything, this appears to be a complaint of defamation dressed up as a data protection matter. Edited to add: Incidentally, the case also highlights an important structural point - chances are that most of the RTBF cases which become public will involve plaintiffs with relatively weak claims. The individuals with strong arguments to be deindexed will probably succeed in private at the point of initial contact with Google or else before the data protection authority. The only cases to be subject to public scrutiny before the courts will be those where both of the initial decision makers have found that the request should not be granted.